From left to right: Sister Mary Liam Brock, Sister Diane Bridenbecker (Vicaress), Sister Cecilia Canales (Prioress), Sister Mary Suzanna Vasquez, and Hermana Verónica Esparza Ramírez (from Mexico) were selected for leadership. 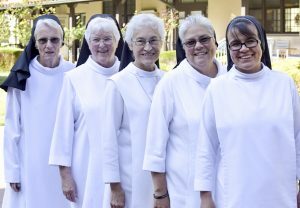 The Dominican Sisters of Mission San Jose elected Sister Cecilia Canales, OP as their new Congregational Prioress during the congregation’s 25th General Chapter. Sister Cecilia will assume leadership in the fall, replacing Sister Gloria Marie Jones, OP who completes her tenure in the post. The election culminates months of study, reflection and prayerful consideration of current and strategic realities. After selecting the Congregational Prioress, the assembly chose a new four member Council to advance the Sisters’ mission. US sisters elected to the team include –S ister Diane Bridenbecker, Sister Mary Liam Brock, Sister Mary Suzanna Vasquez and from Mexico Hermana Verónica Esparza Ramírez.